The 7th episode starts with Seul-Bi making plans with Woo-Hyun, Suk-Hoon and Sung-Yeol to play basketball during lunch break. Young-Eun and Ye-Na ask for Jae-Suk’s help to get Seul-Bi in trouble. In class Ye-Na acts that she lost her phone and that the last time she had it was when she was with Seul-BI and they ask her if she had seen it and she says no. Jae-Suk and his gang get Chun-Shik to give them his phone and put his money in it and tells him to put it in Seul-Bi’s backpack and does this over lunch. After lunch with the gym teacher Chun-Shik tells the teacher that his phone is missing and the teacher makes everyone empty their belongings. Seul-Bi finds the phone in her backpack and then Ye-Na tells the teacher she lost her phone too and Seul-Bi continues looking through her backpack and finds Ye-Na’s phone but the money is missing. Seul-Bi, Chun-Shik and Ye-Na are called to talk to the teachers and she won’t admit that she stole the phones and the other two are fine and happy to have their phones back. The gym teacher then says that she can do community service for a week. Seul-Bi asks why Ye-Na did that and she tells her that she dislikes her because of what she stole from her. Woo-Hyun then pulls Seul-Bi out and she tells him that she thinks Ye-Na put her phone in her backpack and he is mad that she didn’t tell him that she met her yesterday. Grandmother is leaving the hospital to see Woo-Hyun. Chun-Shik gets beat up from Jae-Suk’s group again and Woo-Hyun finds him and asks if he put his phone in her bag and he denies it. The whole class dislikes Seul-Bi now and the teacher doesn’t believe her and when she opens her locker the students and put trash inside. Sung-Yeol comes and helps her clean it up and tells her that he knows it wasn’t her. Seul-Bi is at home and looking at a picture of herself on her phone and notices that she is disappearing in the photo and her Sunbae shows up and tells that she is disappearing and she should sign the black note cause if she doesn’t she will disappear because she is neither a human nor a angel. He tells her the ones that loved humans they became unhappy in the end because human love changes. Grandmother is at home counting up the money she is going to give to Woo-Hyun and then she tries to phoning her son and the number doesn’t work. At school Seul-Bi’s desk is missing and she has to go get it from outside and Woo-Hyun tells her to just go home but she doesn’t want to run away and that it hurts more that he doesn’t believe her. She drags the desk up herself and Sung-Yeol tries to help her but she says it is something that she needs to do alone. Woo-Hyun finds Ye-Na and gives her the money that she lost and she doesn’t want it and he asks why she saw Seul-Bi that day and she lies about it and he gives her the money and asks her to leave Seul-Bi alone. Seul-Bi is picking up the recycling for milk cartons and people start throwing them at her and Woo-Hyun comes in and protects her. Jae-Suk asks if he is also a thief and Woo-Hyun starts beating on him and Sung-Yeol takes him off and keeps him away from Jae-Suk. The gym teacher comes in and stops them and he tells them that they need to bring their parents in. The girl from the cafe finds Seul-Bi and tells her that she is sure she didn’t do anything but that Woo-Hyun will fight for her and it will get hard. Sung-Yeol explains to Woo-Hyun that Ye-Na likes him so she hates Seul-Bi and Jae-Suk hates him so he picks on Seul-Bi instead. Grandmother meets with Mrs. Ahn and she shows her the money that Mrs. Ahn gave her and asks her if she can take care of Woo-Hyun because she can’t get ahold of her son and that she has to go far away for a long time. Mrs. Ahn tells her she can’t because of her situation of her new family and leaves. In the morning Woo-Hyun tells his Grandma that she has to come to school because he got in trouble. Grandma comes to the school and recognizes Sung-Yeol’s dad as the police officer and they talk about how Sung-Yeol hit Woo-Hyun. Mrs. Ahn is going to the meeting and sees the three guys who are in trouble. Jae-Suk’s dad comes and Grandmother starts apologizing right away and Mrs. Ahn comes in and Grandmother is shocked. Grandmother starts apologizing and was going to go on her knees but Woo-Hyun stops her and does it instead and apologizes. Sung-Yeol stands up for him and says that Jae-Suk isn’t the type to just get beat up and that he deserved it and that he would have beat him up if Woo-Hyun hadn’t. The boys leave and Jae-Suk talks trash and Sung-Yeol punches him. Mrs. Ahn tells Jae-Suk’s father that they overlooked Jae-Suk’s cheating incident and the gym teacher talks about how much money his father has spent and the father silences him. Seul-Bi comes in and explains that Woo-Hyun was protecting her because she was called a thief and that she and Jae-Suk should be the ones expelled. Jae-Suks says he will discipline his own son and the teacher can deal with the other two. Grandmother is looking sick and she tells Seul-Bi to leave and Sung-Yeol’s dad says he will give her a ride home and she sees him make eyes at Mrs. Ahn. Grandmother asks Sung-Yeol’s dad later about Mrs. Ahn and he tells her that she is his wife and Grandmother falls to her knees. The gym teacher is having stomach problems and has to use the student bathroom and ends up overhearing Jae-Suk and his gang talk about how Chun-Shik was the one that put the phone in Seul-Bi’s bag and they will punish him if he talks. Woo-Hyun gets 7 days probation and 20 hours of community service. Seul-Bi is on the roof and Woo-Hyun comes they both apologize about the situation and not trusting each other. Woo-Hyun proposes they promise to trust each other no matter what happens and she agrees. Sunbae comes and tells her that it will make everyone have a hard time because of her and having to protect her and it will hurt more and they will change and so will she. She asks if they will be unhappy and he says yes and tells her to come back to her place. Seul-Bi then signs the book and her eyes change back to an angel and this ends the 7th episode. So Seul-Bi will finally turn back to an angel! I have to say I have been waiting for her to be an angel again because otherwise this is just a typical high school drama which can be a little boring!! I have been waiting for more of the scifi elements to be more prevalent in this drama! but of course from the preview it looks like it will not last long her being an angel, I’m guessing the first half of the next episode she will be an angel and will stalk Woo-Hyun and watch him be all miserable and he will search for her everywhere and she won’t be able to handle it especially because in the preview it looks like they are all at a funeral!! oh no I guess that means that Grandmother is going to be dying in the next episode! I hope it isn’t too sad!! I have to say that I really like Sung-Yeol’s dad he seems soo cool and yet handsome even though he is old! But he sure lets Sung-Yeol treat Mrs. Ahn anyway he wants which seems bad! One thing that is weird is that Sung-Yeol should not be in trouble I mean he was breaking up the fight!! so stupid that he gets in trouble! One thing that is weird is that Woo-Hyun is never asking Seul-Bi where she comes from and checking to see if her memory is coming back! I mean it is kinda weird that no one has brought that up and like made her go see a doctor or something? I thought Grandmother was going to collapse at the school so that Mrs. Ahn would see and realize that she is terribly sick and that Woo-Hyun will be left alone because she is dying! I thought it was going to be a perfectly set scenario for that but I guess then it would be hard for Seul-Bi to go back to being an angel ! The 6th episode starts with Woo-Hyun confessing to Seul-Bi and pulling him to her and she pulls away and then runs away from him and can’t figure out why her heart is beating fast and face is hot. Ye-Na is crying to Young-Eun about being rejected from her confession and they go to a restaurant and are talking about Woo-Hyun’s confession and some girls from their school overhear. The next day Woo-Hyun’s grandmother is all dressed up and closes the shop for the day and tells him that she is going on a vacation. At school everyone is talking about Woo-Hyun and Seul-Bi not being cousins and that they are a couple and it is really awkward for them. After school Woo-Hyun tries to catch up with Seul-Bi but she is ignoring him and he has to let her into the shop. Grandmother is really going to the hospital and is having a test done. Mrs. Ahn tries to talk to Sung-Yeol and apologizes about the cheating incident and she tells him that she is going to be him and protect him and he protests and she tells him to meet with his real mom more often and she will try her best to become a real mom to him. Seul-Bi is really awkward with Woo-Hyun and pretends to go to bed and he sends her a text saying goodnight and she doesn’t reply so he finds her outside and asks if she is ignoring his texts now. She tells him that she is not rejecting him but that she doesn’t know and he tells her he will wait then and she can’t avoid him. Woo-Hyun takes Seul-Bi to learn how to ride a bike and she tries it and does it perfectly. They then have a picnic together. At the hospital grandmother learns that she needs to be hospitalized and that her disease is happening more rapidly and she asks for pain meds for a few days to work things out. Woo-Hyun takes Seul-Bi to look at fireworks and jokes with her. At home Woo-Hyun looks up ways to get closer to a girl and he finds watching a horror movie on the cellphone together is the best way so they do that. While they are watching a man breaks in and turns off the electricity and Woo-Hyun faints from the movie and Seul-Bi tries to awaken him but he faints again seeing her with the glow of the cellphone. The man that broke in was the same man from the park and the icecream man that Sunbae could see. Sunbae comes and recognizes and the man starts dancing and ignoring Sunbae. Woo-Hyun’s dad and teacher are patrolling the area and they see the guy running around. Jae-Suk and his gang are bothering a kid and the patrol come across them . The man comes and punches the teacher and the kids run away and then apologizes and says he thought it was something else. Seul-Bi goes early to school for classroom duties and there she meets Sunbae and he gives her a book not hers but it was from angels how returned their black notes to become a human and if she chooses to be an angel again then it will become hers. She asks why they became humans and he tells her not to give her heart to humans and asks her to agree to become an angel again after a week. Seul-Bi does her classroom duties with the girl from the cafe who they helped when her father was trying to get money from her and she sees that she is reading a book about an angel turned human and fallen in love with a human. Seul-Bi asks her questions about the book. Young-Eun and Ye-Na give Seul-Bi a coke and icecream and make her try it together which makes her spit it out on Ye-Na. Ye-Na waits for Woo-Hyun and then acts that she is upset but then acts all forgiving. Woo-Hyun takes Seul-Bi away and says sorry. Sung-Yeol warns Woo-Hyun to stop making Seul-Bi’s life hard for her. Ye-Na tries to give Seul-Bi money for the cleaning of her shirt but she doesn’t want to take it because she spit on her uniform. Seul-Bi goes home alone and a man is there saying that their is a buyer for grandmother’s store so she phones grandmother who is in the hospital. Grandmother tells her that she will take care of it and not to tell Woo-Hyun. Grandmother wonders if she should phone Mrs. Ahn but decides against it. Suk-Hoon tricked Woo-Hyun into helping him sew some dolls to help his family make money and Woo-Hyun wants to take a doll in return. Seul-Bi gets a phone call from Ye-Na saying that she doesn’t want to live without Woo-Hyun and gets her to come. Seul-Bi comforts her and Ye-Na makes her get her water and tissues and gives her money and makes her leave her purse and Ye-Na opens the purse. Ye-Na then goes back to the cafe and talks with Young-Eun and they discuss the plan that she leave her phone in Seul-Bi’s purse and the girl from the cafe overhears it. Woo-Hyun meets Seul-Bi and he gives her the doll and they both hold one of its hands and walks home and this ends episode 6. One thing I don’t quite understand is that Ye-Na says she has been in love with Woo-Hyun for 3 years but he only recently transferred to her school? unless just from going to the restaurant she has been watching him? I am really wondering if we are going to see Seul-Bi as a an angel again? I mean for the love story to work she can’t go back to being an angel so I wonder if she will go back for a little while and then change her mind and realize she is in love with Woo-Hyun? but I am not sure she knows how to become human again because she doesn’t even know how she did it in the first place? I wonder who that weird guy is hanging around them ! I wonder if he was once an angel but became human and somehow had something to do with her turning human? I want to see her turn into an angel again!! lol but at the same time there is not much for her when she is an angel all she does it work and watch dramas on other peoples tvs. If you guys are enjoying High School Love On! I would also suggest to check out surplus princess because it also has magical elements to it as a mermaid turns into a human!! The 5th episode starts with Woo-Hyun about to be run over by Jae-Suk’s motorcycle and Seul-Bi and Sung-Yeol get there in time and she uses her power to turn off his motorcycle. Seul-Bi faints and Sung-Yeol catches her and then goes and starts beating the guys up. A man in the park separates them and starts playing his recorder and gets Woo-Hyun and Sung-Yeol to leave. On the way home Seul-Bi tries to get the guys to get along better. Woo-Hyun looks up why people always fall asleep and finds the condition narcolepsy and finds that kiwi is good for people with that problem. In the morning he makes a whole meal made of kiwi. At the staff meeting it is decided that Jae-Suk is going to get away with it and just has to do volunteer work. Mrs. Ahn tries to fight that it will hurt Sung-Yeol and will be unfair for him but the principal overrules them. Jae-Suk’s homeroom teacher tells Jae-Suk about his community service and Jae-Suk tells him that he knows his father is paying for the new gym floor. Jae-Suk tells Suk-Hoon that he owes him but Suk-Hoon seems to disagree with him. Jae-Suk’s guys are cleaning up the campus for him and the talk to Ye-Ri who is talking about auditioning for Juliet and it seems to be Jae-Suk’s sister. (Young-Eun) the girl bully goes up to Jae-Suk and tells him not to beat up Woo-Hyun because she can make sure Ye-Ri can never audition again in her life. Seul-Bi then comes up to him and tells him not to beat up Woo-Hyun and then gives him a band-aid. Seul-Bi and Woo-Hyun have a group project but everyone leaves and it is only the two of them. Ye-Na the other girl bully gets picked up from her mom and whisked off to golf practice. Sung-Yeol’s Dad gets dental surgery and then finds Sung-Yeol and handcuffs himself to him and they go eat that way together. Seul-Bi makes porridge for Woo-Hyun’s grandmother and he helps put an apron on her and Ye-Na is waiting outside and then comes in. Woo-Hyun feeds grandmother and he tries to convince her to go to the hospital because he can’t live without her and she avoids answering him. Seul-Bi goes and talks with Ye-Na and Ye-Na tells her that she likes Woo-Hyun and she doesn’t think they are cousins. She tells her not to think of liking Woo-Hyun in the future because he is like oxygen to her and the only escape that she has. Ye-Na’s mother phones her and she tells her that she is sick and her mom won’t let her rest and she starts crying and tells her that she is really sick. At school in PE Ye-Na pretends to trip in front of Woo-Hyun and he takes her to the nurse. The nurse doesn’t come and they talk and she tells him that her mom wants her to go to a prestigious school and is going to do that through sports because she isn’t smart and that she is doing it to fulfill her mom’s dream. When Seul-Bi is going home Sung-Yeol finds her and asks to go for ice cream and she says she will take him and they go look at makeup together. Sung-Yeol meets the guy from the park again and gives him free ice cream. Seul-Bi spills ice cream on Sung-Yeol and her Sunbae shows up and tells her not to fall in love with a human because she won’t be happy because humans can’t live forever and are weak. The man that gave ice cream talks to Sunbae and can see him. Mrs. Ahn goes to see grandmother and asks her to take Woo-Hyun out of her school because she has a son there and nothing good will come of him knowing her. Grandmother refuses and tells her to send her son somewhere else and Mrs. Ahn gives her money and Grandmother splashes her with water. Sung-Yeol, Woo-Hyun, and Seul-Bi meet up walking to the restaurant and see Grandmother handing Mrs. Ahn the money and she makes an excuse that she left it behind. Grandmother is shown later throwing up. The group from school go riding bike together and Ye-Na asks Seul-Bi to stay away because she wants to confess to Woo-Hyun. Ye-Na asks if Woo-Hyun can give her a ride because her ankle still hurts and he agrees. Sung-Yeol gives Seul-Bi on his bike. Ye-Na on the ride confesses to Woo-Hyun and he says he is sorry. When Sung-Yeol and Seul-Bi catch up to them Woo-Hyun stops their bike and says to Seul-Bi to come to his side and this ends the 5th episode. So it looks like Grandmother is dying since they are showing her get sicker and sicker. Seul-BI is losing her powers and if she falls in love which is most definitely happening she will become human. The man from the park must be a angel that turned human or something because he could see Sunbae. Woo-Hyun seems like he rejects all girls that confess to them because of the lack of trust issues with his mother leaving him but it seems like he is falling in love with Seul-Bi because she is always there for him when he needs her. I wonder why it is so bad for Woo-Hyun to know his mother and why would she want him to transfer, but I kept thinking that if Grandmother is dying he should know who his mother is and he may need help if he is still in high school. Through this episode Jae-Suk’s red bruise on his face looked so face it looked like someone just rubbed some blush on his face!! I have to say I really like Sung-Yeol’s dad he seems fun and silly but he really lets Sung-Yeol act pretty bad in front of Mrs. Ahn. I just want to remind everyone that their is a poll for who you think Seul-Bi should end up with !! Please vote and have fun!! Come up with your own option if you want!! The 4th episode begins with Seul-Bi seeing her Sunbae and trying to talk to him and Woo-Hyun thinks that she has regained her memory. Seul-Bi tries to use her powers again and passes out and Woo-Hyun takes her back and puts her in his bed. He goes and gets medication for her because she has a fever. When she wakes up she remembers the sewer grate was lifted up for her and thinks it must have been her Sunbae doing it for her. Woo-Hyun gives her a cellphone and at school she gets Sung-Yeol’s number and Ki-Soo’s(Woo-Hyun’s friend) number. At lunch Woo-Hyun thinks that the soup tastes funny and Ki-Soo says he checked twice about it being anchovy broth. Mrs. Ahn (Sung-Yeol’s stepmom) starts choking during lunch. Woo-Hyun stomach starts hurting and then is taken to the hospital by Seul-Bi and Ki-Soo, and Mrs. Ahn is also taken in by another teacher. Mrs. Ahn pulls back the curtain and sees Woo-Hyun and wonders if it is her Woo-Hyun. His grandmother comes and complains that he inherited his shellfish allergy from his mother. Mrs. Ahn hides from his grandmother. Jae-Suk(Bully leader) was bullying a student and Seul-Bi gets involved and Woo-Hyun stops it and Sung-Yeol gives him money Jae-Suk was taking from a student. Jae-Suk then smashes Sung-Yeol’s fingers in his locker and is mad at him for giving him money and says he shouldn’t have helped him earlier and let him die and Sung-Yeol agrees with him. Jae-Suk gets caught for kicking the locker and in the teachers office he sees a student leave with the teacher’s test for tomorrow and follows him and catches him stealing the test. At home Woo-Hyun tries to teach her how to make a bubble with gum and they talk about being jealous. Sung-Yeol’s dad makes breakfast and Sung-Yeol is mad because he never even made ramen for his mom. Woo-Hyun’s grandma was sick all night so Seul-Bi cuts the onion for her her and is crying. Grandma comes down and acts like she wasn’t sick but when they leave she is in pain. Jae-Suk gets the guy who cheated to agree to share his answers during the test. During the test the guy gets two papers so he can fill it out for Jae-Suk. Woo-Hyun sees Jae-Suk hit the back of the guys chair. During the test Mrs. Ahn sees Jae-Suk with 2 answer papers and asks who gave it to him and he lies and says Sung-Yeol. Mrs. Ahn scolds Sung-Yeol and doesn’t believe that he didn’t do it. As Woo-Hyun is leaving school he remembers Jae-Suk kicking Suk-Hoon’s chair and goes and tells Mrs. Ahn that it wasn’t Sung-Yeol and also that he hurt his right hand so he wrote with his left hand and that he will get more evidence to back it up. Woo-Hyun finds Jae-Suk and his dad comes out and scolds him for cheating and getting caught. Jae-Suk says he did it because he would kick him out for his bad grades and his father says that he is getting a DNA test because he doesn’t believe he is his son. Jae-Suk sees Woo-Hyun hiding around the corner and grabs him. Seul-Bi invites Sung-Yeol to come to the restaurant and while he is there Jae-Suk picks up the call from Seul-Bi to Woo-Hyun and tells her to come. Seul-Bi and Sung-Yeol both go running and Woo-Hyun is on the ground and Jae-Suk has his bike and looks like he is going to run him over. This ends the 4th episode. Oh High School bullying! I mean it is a little bit cliche!! this two always seem to go together. The whole cheating thing seems silly I mean why wouldn’t he just got Suk-Hoon to send him the test on his phone and got him to give him the answers. That seems less risky and I mean how would he really have enough to fill out the answers for himself and then give it for someone else to copy that would take time! I think it is cute the way Seul-Bi doesn’t know how to do things like blowing bubbles and it is cute when they show that aspect of her. It is obvious that both Sung-Yeol and Woo-Hyun both like her and well even her Sunbae has feelings for her. I kinda like the match of her and her Sunbae I guess he is more tsundere!! How typical three guys love and take care of her and she is the typical clueless, adorable lead!! Why is it that there is always multiple people that will love the one girl!! Save some for the rest of us!! So it seems that Jae-Suk and Sung-Yeol have some history where Sung-Yeol helped him and that is why he can’t bully him. Sung-Yeol also eluded to some history with Woo-Hyun where he eavesdropped oh him! So maybe they do know each other but Woo-Hyun seemed to not remember or denied it? The third episode starts with Woo-Hyun drowning and Seul-Bi jumps in and tries to save him, Sung-Yeol also comes along and jumps in and yells for him to stand up because the water is only waist deep. The next morning Woo-Hyun realizes that his necklace is gone and he doesn’t know it is in the pool. He fights with his grandma and she tells Seul-Bi that the necklace was given to him by his mom and is very important to him. His grandma needs medicine and then asks Seul-Bi if she wants to go to school and she says yes. She goes to do her paperwork and a man stops her and switches with her paperwork. She meets her Sunbae and he questions whether she wants to stay as a human. The bully bothers Woo-Hyun at school again and the teacher walks in with Seul-Bi and she goes over and bites the bully. She is introduced as a new student and she tells him that she lives with Woo-Hyun. She gets to sit next to him and some girls become jealous and scheme to bully her. The group of girls bully her in gym class and start throwing the ball at her and give her a nosebleed. Woo-Hyun stops a ball and drags her outside and scolds her for not realizing that she was being bullied. He gives her tissues for the blood and the teacher catches them thinking they were being romantic and makes them clean the library. Woo-Hyun talks about not caring about the necklace and Seul-Bi can hear the change in his voice and realizes he is lying. After school Seul-Bi goes to the pool to try to find his necklace and Sung-Yeol helps her get the key to get in. Seul-Bi tries looking but can’t find it and she goes to work. 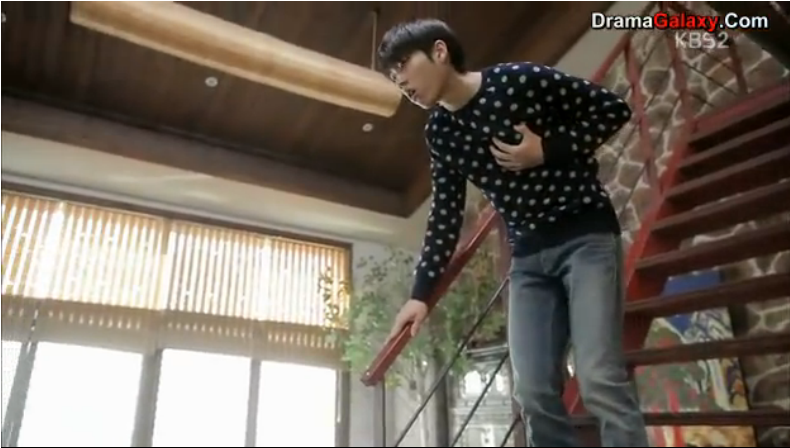 Woo-Hyun goes into the pool to find the necklace and finds it thinking that is Seul-Bi’s necklace. The two bully girls from school call Woo-Hyun’s grandmother’s place for food and Woo-Hyun and his friend walk into the cafe and the girls hide from them. The girls leave when Seul-Bi goes to the cafe and at the cafe the worker is being harassed by a man. Woo-Hyun tries to stop the man but gets pushed down. Sung-Yeol father the policeman is walking by and hear the cries and come in. They grab the guy and he says he her father and she says he isn’t and then tells them that as a father he takes her money and gambles it away not taking care of her and the cops take him away. Seul-Bi tries to reassure the girl but she tells her to leave and is angry. As they are leaving Woo-Hyun gets a call from Sung-Yeol for Seul-Bi and she runs off to meet him. Sung-Yeol has the necklace at home and his stepmom comes in and sees it and recognizes and asks which friends it is but he doesn’t tell her. Seul-Bi and Sung-Yeol meet and gives her the necklace and tells her that she owes him tea but she hears the word car instead and they go to an arcade and play a racing game. She then buys a miniature car for him from a machine and they go home. Woo-Hyun goes shopping for his grandmother and meets the guidance counsellor/stepmom and she asks what his name is again and follows him to his restaurant and hides when his grandmother looks her away. Some teachers come to the restaurant to eat and the music teacher likes the nurse and the nurse likes the foreigner teacher. Woo-Hyun goes to find Seul-Bi and as she is going home she drops the necklace when she is almost hit by a bike and lands in the sewer grates. As she picks it up someone throws water at her and she drops it in. She tries to use her powers to lift it up and her Sunbae watches her from a distance. Woo-Hyun then sees her walking and she seems weak and he runs to her and she shows him the necklace and puts it on him. He says thanks and pats her head and then notices that she smells. She then sees her Sunbae and starts running to him and Woo-Hyun turns around and seems to see something and this ends episode 3. The third episode was only aired this week because it wasn’t aired last week. So it seems like Seul-Bi’s Sunbae seems to have a crush on her because of the way he is always looking out for her. He almost seems to be annoyed that she seems to be fitting in as a human and maybe is jealous of Woo-Hyun. This school plot with the girls bullying another girl for being close to the popular boys seems like a cliche plot line. I wish the used the angel angle more I mean not having powers seems like they are taking away the most potential interesting part of the plot. I mean I would enjoy more background information on the angels and her Sunbae and wish they would play up that part more. So Woo-Hyun’s mom must be the Sung-Yeol’s stepmom. I wonder why she wouldn’t have recognized her own son and why are they estranged? Seems like there is an interesting story behind that. It sure made me nervous when she carrying around his necklace so carelessly and of course then she drops it! It is not a good sign that Woo-Hyun’s grandmother is sick and they keep showing that and I wonder if that means Woo-Hyun’s mom is going to have to help him if she get really sick? I really wonder if Woo-Hyun was able to see what Seul-Bi could see? He seems to be shocked about something?